Here’s my New Hiding in My Craft Room Challenge #297 April 15th Star Stampz & Tic-Tac-Toe! 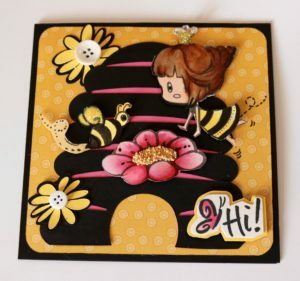 I used my Pazzle Electronic Cutter to die cut a cute Bee Hive & additional yellow & black flowers, I used Copic Markers for Blending, and who doesn’t have a few buttons to make the card complete. Layer with black card stock and a cute yellow/gold sheet from the Jen Hadfield’s “simple life” 6×6 Paper pad I picked up at Tuesday Morning. I fussy cut the challenge images we were given. I love bright colors and if you ever want to win free images or craft products, go to the HIMCR (Hiding In My Craft Room) Button in my blog! I will be a designer hopefully for the next 5+ months! It’s been fun so far! Stay tuned though…. I will be working the next few days on a high school graduation project for a dear friend of mine, Kaitlyn. She will be off to college next year for Soccer which is really exciting! I’ll post those photos later in the week. Previous Previous post: Not Paper Crafting – But Cooking Meals with a Pressure Cooker!